The South Fork American River has served as a perfect introduction to California rafting adventure for thousands of beginner rafters for the last 30+ years. But there are also sections of it that are exciting enough to lure many back year after year. Are you looking for a short yet thrilling trip? Are you a first time rafter that wants to “test the water”? If so, the morning Half Day Chili Bar Run on the South Fork of the American River is the perfect trip for you. It’s a 6-mile long non-stop action rafting trip with thrilling Class 2/3 rapids that are perfect for every level of rafter, from beginner to experienced, from youth groups to corporate groups. This three hour half-day rafting trip will give you about two hours of river time during which time you will be getting wet, hooting and hollering, paddling and laughing your way down rapids like Meatgrinder, Triple Threat, Maya culminating with Troublemaker Rapid – the biggest Class 3 rapid on the South Fork of the American. Your day starts at 8:30 AM when you meet for your trip at our deluxe campground. You will be given a short pre-trip briefing by your trip leader mostly on what to bring and what not to bring on the raft. Soon after you’ll walk through our gear cage grabbing a lifejacket, helmet and paddle before you hop onto our shuttle for a 20 minute ride up to the Chili Bar put-in on the South Fork of the American River. Once you arrive at the put-in you can make a last minute restroom stop. Your guides will fit your river equipment, give you a detailed safety talk and show you how to sit in the raft and how to paddle. By 10:00 AM you will be hitting your first rapid and the fun only gets better! After floating and enjoying the scenery and paddling through dozens of rapids you will round the bend below our camp and paddle into the grand finale – Troublemaker Rapid. Since our guides are real pros and veterans of the river they usually make it look easy but not without getting you soaked from head to toe several times. Once you are back on solid ground you will take a short walk back to camp for hot showers and to view photos of your rafting antics from the past few hours. By 12:30 PM you will be ready to head off to drive back home or continue onto your next adventure! Or you can join us for lunch after all that hard paddling work. There are heaps of good reasons why American River rafting on the South Fork is one of the most popular river trips in California. 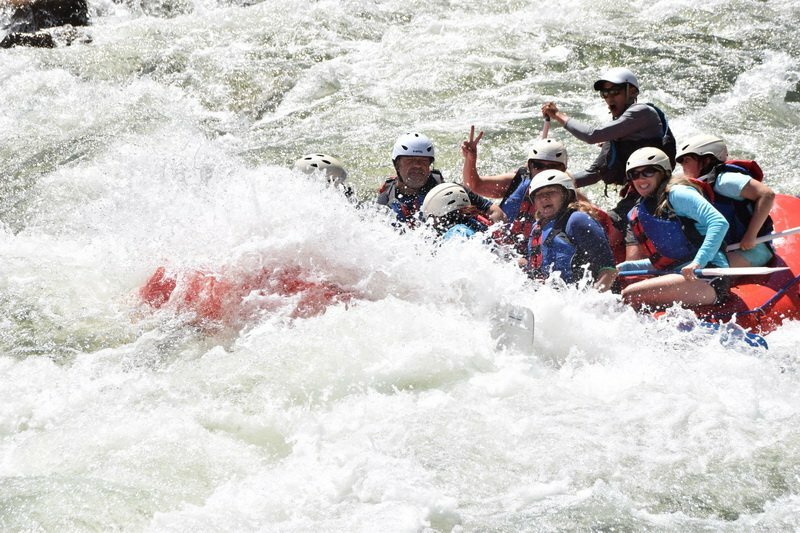 You will absolutely love the experience regardless of whether you decide to do a half-day rafting trip or a full day rafting trip on the American River. When other California rafting trips have dried up, the South Fork American River still have stable fun water flows from the Chili Bar Dam always providing an exciting and fun time. Even during drought years or high water seasons, great recreational water releases are guaranteed and South Fork American River rafting trips are available from April through September and even on weekends in October. There are many memorable rapids as the river winds it’s way through the rolling foothills of California’s scenic Gold Country. Don’t wait any longer – give us a call at 800-825-3205 and let us show you an absolutely fabulous time on the river. This morning half-day rafting trip on the South Fork Chili Bar is offered every day of the week. The meeting time for this trip is at 8:30 AM at our River Camp in Coloma. Click here for Directions. This trip will depart from our Camp at 9:00 AM sharp so please arrive on time. Groups of 6 or more that want a slightly later start time can call us for availability. You can also choose to camp with us the night before. This trip ends at our River Camp below Troublemaker Rapid between 11:30 AM & 12:00 PM. Get ready for your South Fork whitewater rafting action! Check out our Equipment List for items you will need for your trip as well as maps and directions to our River Camp. Spend the afternoon exploring the historic James Marshall Gold Discovery Park located just a short walk from our campground. Additional camping and meal options are also available. Please call 1-800-825-3205 or email us for details. GROUP SPECIALSFor every 5 paid rafters the 6th goes for 50% off. For every 11 paid rafter the 12th goes for FREE and so on. For 18 rafters one goes for FREE and one goes for 50% off. Groups of 24+ call us for Special Large Group Prices.